For the control of benzimidazole-sensitive mature and immature gastrointestinal roundworms, large lungworms, tapeworms and aids in the control of adult liver fluke in sheep, lambs and goats. Use in conjunction with other drenches that do not contain a benzimidazole active. Useful as a goat drench where benzimidazole effectiveness still exists. For your white drench rotationALBEN contains albendazole, a member of the benzimidazole (BZ or white) drench family. If white drenches are still effective on your property, ALBEN provides an opportunity to rotate away from macrocyclic lactone (ML) or levamisole (clear) drenches. Broad spectrum worm controlALBEN will control all major roundworms that are susceptible to a BZ drench (except whipworms). These worms reduce overall productivity especially in young animals. Weight gains can be affected significantly. 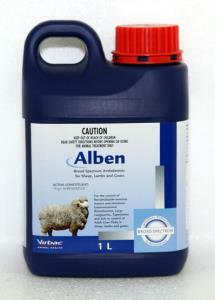 ALBEN also controls tapeworms and aids in the control of adult liver fluke. Registered for goatsThere are very few drenches registered for use in goats. ALBEN has been used safely by goat producers across Australia for many years, and continues to be one of the more popular drenches used in the goat industry. Very safeAlbendazole is amongst the safest of all active ingredients used in oral drench formulations. OvicidalAlbendazole is ovicidal, ensuring that roundworm eggs passed in the dung are rendered infertile, reducing the potential for further pasture contamination. To obtain the maximum benefit of this, sheep and goats should not be placed on clean pasture until 12 hours after drenching. For animals in excess of 80kg dose at 1mL/5kg bodyweight. To aid in the control of adult liver fluke dose at 1mL/4kg.